Let me first get this disclaimer out of the way. This is MY photo. This is NOT my idea. I have seen this around a few times and just had to try it. I usually only do original recipes but sometimes I find things so cool I have to give a go myself and want to share with you all! I changed up the cake and such as well. Ok, though this is very easy, it is a little bit of a process so lets get started with what you will need for the whole shootin' match. I of course, forgot to take a photo of my ingredients for you all. I am slow getting my mojo back I think! Oh heck, it is after 3pm. A glass of wine will surely help, BRB. OK, back. Yes, I can already tell it is helping! First, lets deal with the eggs. I used just 3 colors of dye. Use however much you want, but do not boil eggs first, dye them raw. If you don't know how to do this, read the box, and then go back and re-live your childhood because you missed out big time! You can draw on them carefully with crayons first if you like, all that normal stuff, just get them dyed and set out on a paper towel to dry. Once the eggs are dry, using the tip of a small knife pierce one end, begin removing bits of the egg shell until you have opening big enough for the yolk and whites to get through. It takes a little waiting and jiggling but they will come out of a smallish hole. I would go maybe the size of your pinky fingernail size! Real scientific terminology around here, eh? Do this with all eggs. Make sure to drain however many eggs you need for your cake into a separate bowl so you can add them. Now carefully rinse the inside of your eggs out with lukewarm water and set so the hole is facing down and they can drain and dry. While they are doing that let's get to the cake mix. Mix the cake according to package directions. Use the eggs you drained for your egg requirement. I also divided my cake into 2 bowls and colored them, one yellow and one red. This is completely optional or use whatever colors you like. Put the batter in Ziploc bags, that you will snip the corner of when you are ready. Don't do that part yet!!!! Get your cupcake tin ready. Using small pieces of tin foil, use them to set the eggs upright, do one at a time get the foil in and then set the egg in so it will hold the batter and bake evenly. Do this with all the eggs. Now spray the inside of your eggs with a little bit of nonstick cooking spray, do as thorough as a job as possible! Now, snip a SMALL bit off of the corner of your Ziploc bags and fill the eggs a little less than 3/4 of the way full. Do not worry if you get it a bit more full then you want, I will tell you how to deal with that when they are done baking. I did half one color and half another and then took a long skewer and attempted to swirl them a bit. Now bake for 23 minutes. Not 22, and not 24, 23. I don't know why, I used the cooking time from a different recipe and it worked perfectly. If there is cake overflow and I am sure there will be. Use a knife or your fingers, or both and scrap off the cake, make sure to eat it! Use a damp towel to wipe off the egg and just put that part down since it will remove a BIT of the dye. Let cool 15-20 minutes. Serve in a basket full of Easter grass, hole side down. When your children or company crack one open it will be full of cake!!! AFTERTHOUGHT- I decided since these eggs had no frosting they needed "something". I took some vanilla pudding in a pastry bag and a star tip. Inserted it until I felt it was int he middle and shot it with some pudding filling! You could use jelly or whipped cream, or just leave them plain! I am thinking this is quite cool! Right now I want to make them for Easter, but we'll see how enthusiastic I am next week!! LOL Fun fun idea tho! I plan on using a box of Betty Crocker cake mix. 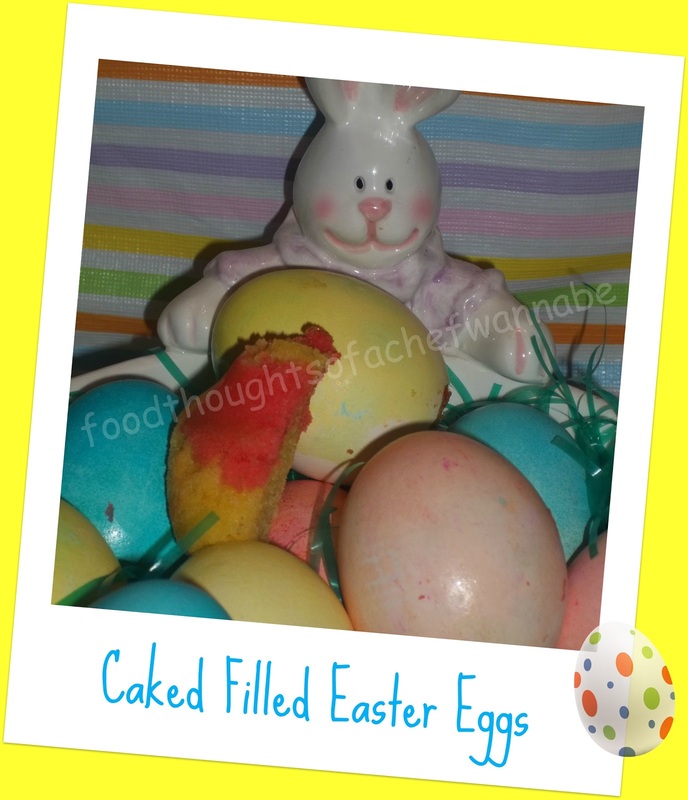 How many cake eggs do you reckon I can make? I plan on using a box of Betty Crocker mix. How may cake eggs would that yeild? Hello Aashie! 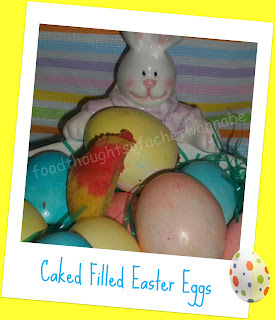 I think you would be able to yield about 18-20 eggs with an entire cake mix!! Let me know how it goes for you! Wishing you a blessed Easter!! This is from Dana. I made these eggs and I really think you need to have the tools to do this. Like cake decorating tips and such. I had the batter all over the eggs and was trying to clean that up. I used a ziploc, but this takes practice! I'll put some frosting on top and some sprinkles to make them look better. The kids will eat them and the adults will say "such a clever idea"...but would I do it again? Probably not. I thought I would do 4 dozen eggs and I just did 2. Yesterday I colored them all, today I baked them and tomorrow I will do the frosting. I wanted them to look like a masterpiece and they didnt. :( Ohh well, I never claimed to be a baker!! lol Its still a fabulous idea and I would love if someone else would make them and see how they do with them. This is Dana. I made these eggs and they did not turn out like I wanted them to. I wrote earlier in this comment box, but I dont know where my comments went. Anyways, I had cake batter all over the eggs, even though I used the ziploc, it just didnt work too well for me. My intention was to make 4 dozen eggs and I did color them all. But I ended up just doing 2 dozen. Its alot of work! Now I have all these colored eggs in my fridge! Gonna make some egg casseroles or something. LOL The kids will love them (I hope) and the adults will think "how clever"! I wanted to put pudding inside the eggs, but the baster I have is just too big and since I'm not a baker, I dont have any other tools of the trade. Anyways, I did try them Chris! Awww Dana!!!! I wish they had turned out better for you!! Did you cut a TINY hole in your ziploc? I am bummed they didn't turn out like you wanted them too :( Hope your Easter is great anyway!! !